Over 350 students from all of Jefferson’s design-related disciplines participated in Design Expo. 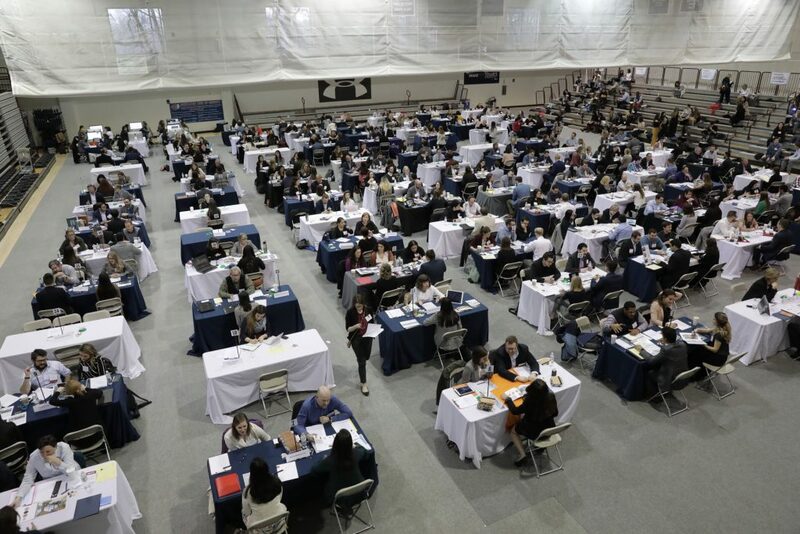 Nearly 100 leading design firms conducted a record 1,150-plus interviews at the University’s annual Design Expo. 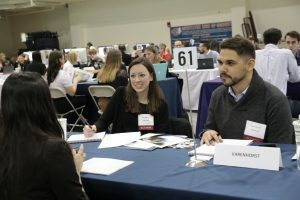 The event allowed over 350 sophomore, junior and senior design students, fourth- and fifth-year architecture students, and graduate students to discuss internships and full-time positions. In addition, during the open networking period, students could approach any employer’s table to pitch a project in their portfolio and network with design professionals. Students from all design-related disciplines participated in Design Expo, including animation, architecture, architectural studies, construction management, fashion design, geospatial technology for geodesign, global fashion enterprise, graphic design communication, industrial design, interior architecture, interior design, landscape architecture, surface imaging, sustainable design, textile design, textile materials technology, user experience and interaction design, and web design and development. Alumni Britt Chapman and Javier Villarroel returned to campus to interview students for design firm Varenhorst. Graphic design communication senior Gabi Stahley had a full day planned with interviews scheduled with MOD, Catapult Learning, Push10, Designblendz, Evoke, Creative Group, GSW and Sparks. “Design Expo is such an awesome opportunity to network and meet with employers in the area,” she said. Seeking a full-time position in lighting and furniture design, senior John Cecil looked forward to speaking with SG Companies, HOK and Gensler at the March 21 event held in the Gallagher Center. “It’s a great place to improve your conversation and interview skills with professionals,” the industrial design student said. On the other side of the table, firms often rave about the connections made at Design Expo. For example, Shannon Geddes, university relations partner for talent acquisition at QVC, frequently hires summer interns from the fashion design program as a direct result of the event. Michael Graves Architecture and Design attended Design Expo for the first time, but the company has hired several alumni over the years—including architectural designer Kevin King ’18. He enjoyed meeting all the emerging talent from the University and recruiting for architectural designer, interior designer and technical architect positions. The Healthcare Career Fair for students and alumni will be held April 1 at Jefferson’s Alumni Hall from 11 a.m. to 2 p.m. People can register until March 31 through HireJefferson, which also lists the employers attending.